In the depth of flavour, fragrance, taste and colour, Mango(ripe) is one of the most famous and nutritionally rich fruit in the world. There is no other fruit in the world which goes to compare with mango by names and colours also. From varieties of mangoes, you can pick any type as per your choice and have it in your own way. Mango season is coming to end. So, why not do some experiment with this mangoes to change your taste buds in different way? The Masala Route presents some special recipes with this “king of fruits”, so that you can take the taste of this juicy flavourful fruit in different ways. 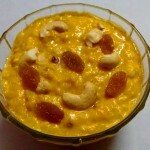 Mango Sheera is the delicious halwa with mango puree, suji and dry fruits. 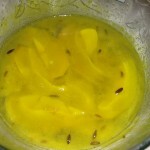 This is the famous dish from India which you can make during Mango season. 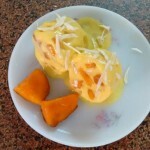 Kulfi stuffed Mango is a popular street fruit in Delhi which is really a perfect creamy dessert to have. You can make this in different fruits like apple too. Make this recipe at home and surprise your family and kids. As Mangoes are still in the season, so let’s make the best recipes with mangoes. 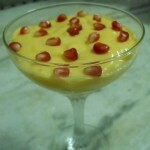 Mango with Greek Yogurt Layer is one such yummy and easy to make recipe. 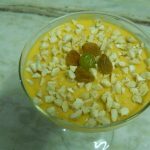 In Summer, desserts made with mango is really delicious to have and while it will be kheer with mango flavoured, then there will be nothing more tasty than this one. In Mango season, if you did not make cake, then it will be unsatisfied season. 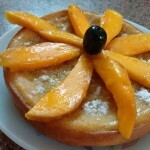 So, must try to make this spongy, softy and moist mango cake at home. This is one of the delicious and special recipes made by our Chef. Give a little twist with your regular Mango Ice-cream and fruits and make this dish super tasty while presenting this to your family, kids, friends or guests. 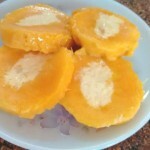 This is one of the popular desserts from the western part of India (Maharashtra & Gujarat) which is made with Mango. Really simple to make yet awesome in taste. 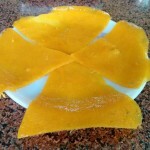 Aam Papad is always palatable dish for kids as well as for elders too. It is very easy to make at home. Mango Chutney in Bengali Style: Sweet & Sour Mango Chutney prepared with raw mangoes makes your taste buds tingle in an instant. 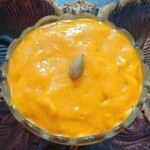 Mango Raita: Mango Raita is a classic Indian curd based relish condiment which is filling, refreshing and delicious too. 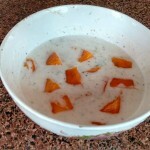 Have this sweet mango fruit based raita in your summer time. 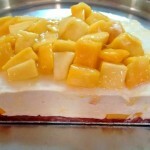 Mango Cheesecake: You should definitely try this yummy no bake mango cheese cake at your home. Fresh mango puree gives this cheesecake a soft, colourful and light texture which makes this recipe so tasty. Mango Kulfi: Summer & Kulfi has been attached with each other and when it comes to mango kulfi, we can’t control our craving. This is a delicious Indian frozen dessert. Mango Lassi: Sweet & Smooth Mango Lassi which is really a chilled beverage to beat the summer heat. Thus, this lassi has many followers all over India. 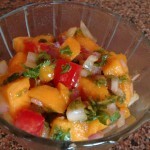 Mango Salsa: Combine with ripe mango, tomato, onion, bell-pepper and other ingredients, the Mango salsa is one of the tasty and flavored salad which you can have with or without fish. Eggless Mango Mint Cake: Soft, spongy and moist pan cake flavoured with mango and mint gives a refreshing morning. 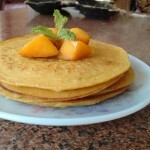 This eggless pancake is easy to make which you can have with mango puree I your breakfast or brunch. 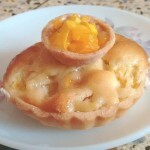 Mango Aalmond Tart: Mango Almond Tart is the right choice for this summer recipes. 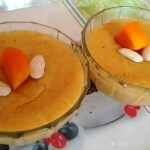 Use of fresh ripe mango makes this recipe a delicious one. 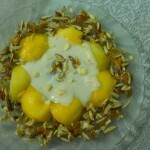 Mango Balls with Yogurt & Nutty Dry Fruits: Healthy & delicious recipe to serve to your family as well as kids. 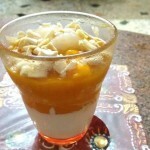 This is really one of the great ways to have dry fruits and mango with the mixture of yogurt. 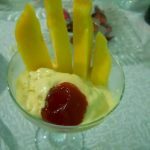 Fresh Mango with Ice-Cream: Ice-cream is all time favourite for all during summer. 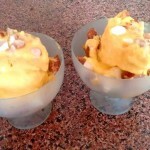 Making Mango ice-cream with fresh mango slices is really great to serve to your children. Banana Mango Grapes Shake: All the delicious and healthy fruits have been included in this shakes. Give you full of refreshment during summer heat. Mango Shake: Mango mix with milk Mango milk shake is a popular drink mainly in North India. 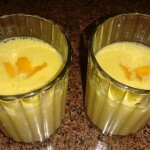 It is a cool and tempting mango fruit drink which is easy to prepare.